So I was booking a flight on Southwest, and they apparently are for full disclosure about fees and taxes and stuff that make my flight cost double what they say they'd have charged me. I casually glance over the table showing all the details, and words "September 11" catch my eye. Funny, I think, it is November now, and I am flying in December, what's September got to do with it? 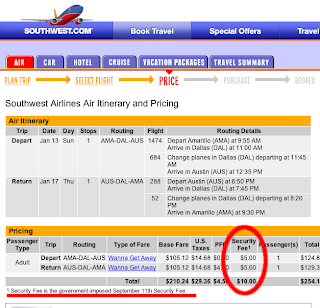 Turns out, there is such a thing as a "September 11 Security Fee" which also Southwest says is government-imposed. So not only do I get to enjoy taking my shoes off plus whatever TSA contractors consider "outerwear" (stripping down to my T-shirt sometimes), taking my laptop(s) out of the bags, complying with the ridiculous 100ml (3.5 oz) restriction on liquids and gels, and sometimes still being patted down and my bags searched--no!--I also get to pay for the pleasure. You know, I'd rather keep my five bucks, thank you very much.